A layer of weak powdery material on the surface of hardened concrete, that is caused too much water for any reason, segregation, or over vibration. Water that rise to the surface of concrete of freshly poured concrete during the process of laying, vibrating and screeding. In the above photo there is a layer of wetness on the surface of the concrete. This is known as the bleed water. In a normal mix that has to be brought to a good uniform finish it is desirable. The water that is seen here is already drying off the surface and finishing will be able to proceed in a short time. If however it started to rain heavily at this stage and continued to rain until the concrete was set then the surface layer would have a lot of it's cement paste washed away, runnels would form and pockets of water may be left behind in these low spots. The following morning the low spots would contain a layer of powdery residue known as laitance. As well the surface will not be durable, it will be powdery because of the lack of the cement paste binder. 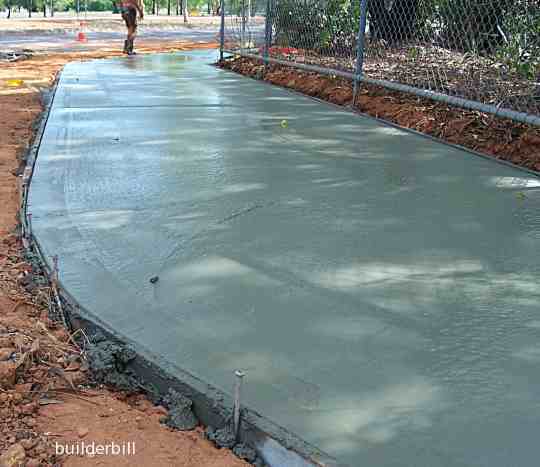 In most cases the concrete finishers would not allow this to happen, and it does not happen to any great extent in slabs where the correct slump concrete is used. It does happen quite often though in deep pours. In walls and columns. The steady vibration can bring bleed water to the surface of the concrete that can not get out of the forms. This water seems to have a light green-yellow look to it. In cases like this the laitance MUST be removed before the next lift of concrete is poured. This is done as soon as the forms are stripped. It is usually an awkward job to do because of the need to work around rebar. For small jobs a rotary hammer drill with a chisel bit is the tool of choice. Otherwise an air driven needle scabbler does the job quickly. On larger projects shot blasting in an option. It must be stressed that any concrete that is about to be joined on to fresh concrete should be clean and with all the weak material removed. Sharp aggregate should be exposed. 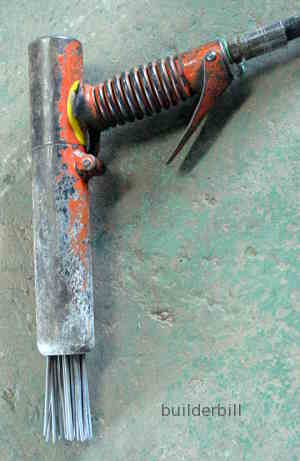 An air driven needle scabbler.